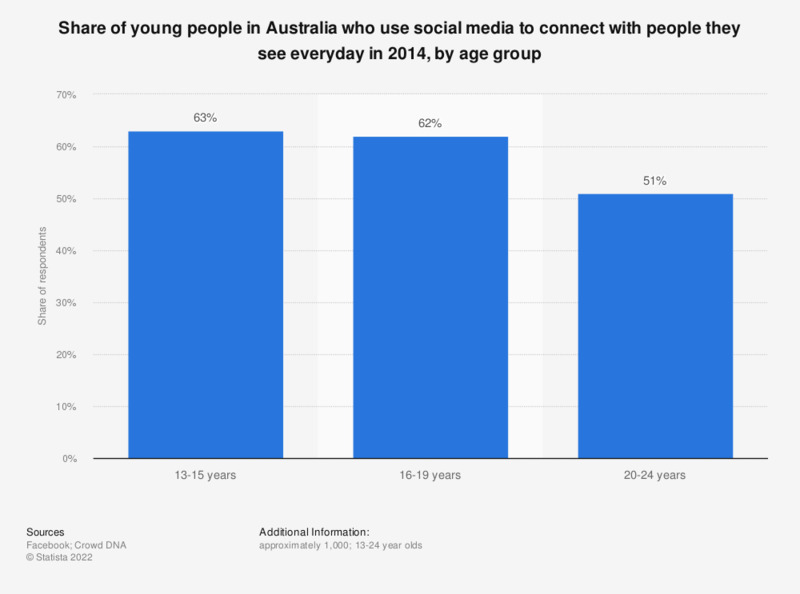 This statistic illustrates the share of young people in Australia who use social media to connect with people they see every day, with results broken down by age group. During the 2014 survey, it was revealed that 51 percent of Australians aged between 20 and 24 years of age use social media to connect with people they were seeing every day. This survey was conducted via an online survey, telephone interviews and mobile diaries. Approximately 1,000 young people from 13 markets (Australia, Brazil, Canada, Denmark, France, Germany, India, Indonesia, Italy, Norway, Sweden, United Kingdom and United States) were surveyed.